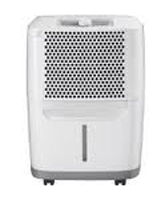 The Frigidaire FAD301NUD is a lower capacity portable dehumidifier supplied by Electrolux, one of the best known home appliance manufacturers in the USA. The FAD301NUD is a new 30 pint model replacing the smaller capacity FAD251NTD 25 pint unit. While there are, as yet, relatively few reviews of this model by consumers those that are available are generally positive. The Frigidaire FAD301NUD is an Energy Star® certified 30 pint model. It is a lower capacity unit suitable for an individual room or a small apartment. Its capacity makes it unsuitable for use in anything but the smallest basement. The FAD301NUD is not designed for use in lower temperatures and would not be a wise choice for any area where the temperature is less than 65°F for extended periods. This is a straightforward dehumidifier with all the features required for use in the home but with few unnecessary frills. It is controlled from a simple, rotary switch mounted on the top of the casing that will appeal to those who dislike the increasing complexity of many home appliances. Frigidaire has opted to replace their 25 pint dehumidifier (FAD251NTD) with a 30 pint model. We believe this to be a sound decision. The additional capacity does not make this unit suitable for applications markedly different from those for which its predecessor would have been bought but it does mean that the Frigidaire FAD301NUD will run for fewer hours per day in any area of a given size than the 25 pint unit. This reduces the noise nuisance and should extend the working life of the dehumidifier. Even more important, the increase in size allows the FAD301NUD to offer improved energy efficiency. This unit will extract around 17% more moisture from the air per energy dollar expended than the lower capacity model. The cost is an increase in weight, by a couple of pounds, although the overall size of this unit is very similar and it is a compact unit suitable for use in areas where space is limited. While there are few reviews of the Frigidaire FAD301NUD currently available the positive comments made in those that have been published suggest that this model is effective, easy to use and economical to run. On the basis of the available information we are pleased to recommend the Frigidaire FAD301NUD to our visitors. The FAD301NUD is a compact dehumidifier with a small foot-print and will fit into areas where floor space is at a premium. It is also a truly portable model weighing a manageable 31lbs. A carrying handle and caster wheels are provided so moving the appliance should present little problem to the vast majority of users. When you decide to buy a dehumidifier your intention is to reduce excessive humidity to a level at which you are comfortable and your home and belongings are protected from direct and indirect moisture damage. Having lowered the relative humidity you simply need to maintain it at a suitable level. The Frigidaire FAD301NUD incorporates an adjustable humidistat which operates in a way similar to a thermostat. Whereas a thermostat switches your heating system on and off to maintain the programmed temperature a humidistat cycles your dehumidifier on and off to maintain your chosen level of relative humidity. This feature saves energy by preventing the applance from operating when it is not needed. You can choose any level of relative humidity, from 35% to 85% but I would suggest 45-50% as the ideal setting. At this level the occupants of your home will feel comfortable, you should not have problems with condensation, no mold should grow and the population of dust mites, while it can never be eliminated, will be kept under control. If you or a family member are allergy sufferers and one or both of these unwelcome guests provides the trigger this will be a matter of great concern for you. There is always a temptation to go a little too far and some folks program their humidistat to the lowest setting. While understandable this is unnecessary. You will notice little if any difference in comfort by choosing a lower setting and it will provide no additional protection against mold or dust mites. The only tangible results will be to increase your energy bills and reduce the working life time of your dehumidifier! The only exception to this general rule applies to those hardy souls who live in areas where winter temperatures drop way below freezing point. In such places it may be necessary to reduce relative humidity to as little as 30% to prevent condensation in your home. While we are on the subject of cooler temperatures it's a good time to mention the auto-defrost feature of the Frigidaire FAD301NUD. As most of you will know a dehumidifier removes moisture from the air by condensing water vapor onto cold coils, known as evaporator coils. These coils are so cold that ice can form on them at temperatures as high as 65°F. The ice has two unwelcome effects. It insulates the coils, reducing the unit's effectiveness, and if it is allowed to stay on the coils it will damage the appliance. To prevent this there is a sensor to detect the formation of ice and a switch to shut down the compressor. The fan continues to blow air across the coils which helps to melt the ice. Once the ice has melted the compressor restarts and moisture removal resumes. The purpose of this feature is to protect the appliance from damage and it makes it possible for the unit to operate at temperatures down to a cool 41°F. At temperatures below 65°F however the appliance becomes less effective and the cooler it gets the less water is extracted and the more energy wasted. For this reason a portable model like the FAD301NUD is not a good choice for use in a cool location; an unheated garage in an area with cold winters for example. From listening to dehumidifier users it is clear that there is still some confusion about water extraction rates. The Frigidaire FAD301NUD is a 30 pint dehumidifier. That is not a measure of the size of the water collection container, which is much less. A 30 pint unit will extract 30 pints of water per day. Even this is not as clear as it appears. The amount of water extracted decreases as temperature and/or relative humidity falls. For this reason most dehumidifiers sold in North America are rated at "standard" conditions of 80°F and 60% relative humidity. Most of you will find that your FAD301NUD extracts much less than 30 pints per day in the conditions normally found in your homes. Nevertheless, because the water collection container can hold much less than 30 pints (actually more like 8 pints) you will find yourself emptying it at least once, possibly twice a day. If this is an unwelcome or inconvenient chore you can take advantage of the continuous drainage feature of this model. This feature allows a hose to be attached to an outlet port in the casing so that the water will run away to a nearby drain as it is collected. The drainage is by gravity feed so it is important that the hose slopes downwards over its entire length and that the drain is only a few feet away. To assist the flow you will find it helpful to raise the appliance a foot or two above floor level. Operating the FAD301NUD could not be simpler as most of its function is controlled by a simple radial control on the top of the unit. The primary purpose of this control is to set the level of relative humidity you wish the appliance to maintain. There is no digital display with this model so you will not be able to monitor the relative humidity in the room by referring to the unit. This is really no disadvantage. The humidity readings taken by portable units, even from the best manufacturers, are seldom accurate to within less than +/-5%. Because this is the case we always recommend that our visitors purchase a separate hygrometer (like a thermometer but to measure relative humidity) to monitor the moisture level and make sure the appliance is doing what you expect it to do. An anti-microbial filter is fitted inside the appliance which is both removable and washable. Its purpose is to protect the unit from airborne particles which can damage it. This filter should be removed and cleaned at the time intervals specified in the manual. I cannot emphasise strongly enough the importance of this simple item of maintenance. If it is neglected the performance and working life-time of the appliance will be reduced and if it is ignored completely the unit may suffer from over-heating with a small but real risk of fire. If the power supply is interrupted the Frigidaire FAD704DUD will switch on again, at its last programmed settings, when the power is restored due to its auto-restart feature. Auto-restart is particularly useful if you are using the appliance in a location where you cannot attend it daily. One feature that has not been included with this unit should be mentioned. It has no on/off timer mechanism so if this is something you need please do not purchase this model. Currently there are very few reviews of the Frigidaire FAD301NUD written by users but these few are generally favorable. The unit is described as effective and easy to use. There are few complaints about noise level. The water bucket is described as easy to remove and replace, helped by provision of a fold down handle. The filter is also easy to remove, clean and replace. There are no serious complaints so far. Due to the relatively short time during which the FAD301NUD has been available there is no reliable information from dehumidifier reviews about its reliability and longevity. Although the limited time since the introduction of the Frigidaire FAD301NUD makes it difficult to draw firm conclusions about the qualities of this new model the early reactions of consumers are positive. Frigidaire appear to have produced a competent appliance and avoided the temptation to include too many "bells and whistles" in an attempt to keep this model simple to use and less prone to breakdown. On the basis of the evidence available to date we are pleased to recommend the Frigidaire FAD301NUD Dehumidifier to our visitors.